This pizza was not the product of original thought. Instead it was born of the desire to eat what I'd had at Pizza Farro weeks before. I was semi-thwarted in my aim since the Mediterannean Wholesalers were out of black olive tapenade. Green tapenade was an option, but instead I went with a jar of sliced black olives. In the absence of this preferred base I instead doused the pocket bread with olive oil, just enough so it glistened. Sliced garlic was smoothed into the oil. 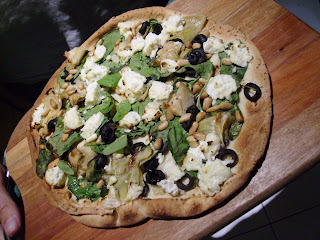 On top of this went the sliced olives, pine nuts, artichokes (also from Med W'salers) and a load of crumbled ricotta (who would have known such a versatile and delicious ingredient would be so affordable? It's something like $6 a kilo, cut fresh, from the Food-Rite in Thornbury). Spinach leaves finished off the toppings. It certainly smelled and looked the part. The lack of that moist, olive base did let the pizza down, but all the right flavour combinations were there. I didn't have the spelt base that Pizza Farro does so well, but the pocket bread base does a similar job in keeping the carb factor down to a minimum and letting the toppings sing out for themselves. All in all, a successful rendition of a restaurant-inspired dish, which doesn't even require a lot of washing up!